“Strike while the iron is hot,” is an old and well-known proverb; but I have coined a new maxim, “Strike till the iron gets hot.” It is true that, in forging, we can do little with cold iron, but with smaller articles we can pound the heat into them. Take a piece of Swede iron of mild steel,—a quarter-inch rod, for instance,—and point it out fast over the edge of the anvil, and if the rod is ice cold in the start, it will take but a few seconds before it is of a high red heat. The spectacle is worth the trouble. The first step in forging should be to point a rod over the edge of the anvil. It takes a good smith to be able to point a rod of American iron without splitting the iron into a brush shape on the point. When you have pointed the rod, you will find that the sides—for it should be a square point—are not square; and why are they not? For two reasons; you have not turned the iron to the right angle, or you have not held the hammer to the right angle. I advise all new beginners to practice until they can hammer out a square point with right angles. When you have learned to sharpen or point a piece of quite poor iron without splitting the point, then you will also be able to hammer the red heat into a piece of mild steel or Swede iron. In pointing or sharpening anything, hold the hand with the rod a good deal higher than the anvil, and let the end of the iron rest on the outer edge of the anvil. See Fig. 7. Bend the iron to a U-shaped piece. Both ends should be of the same length. 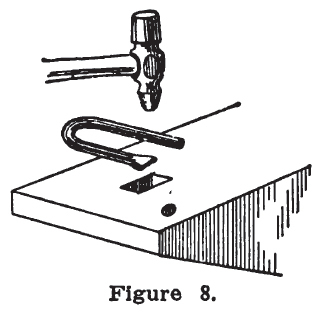 Then place on the anvil, and scarf the ends, as shown in Fig. 8. You will note how the ends are scarfed with the flat cross pene of the hammer. When a round pene hammer is used, the link or ring has to be placed over the edge of the anvil, in order to scarf the ends; but this is more troublesome, and, for that matter, a round pene hammer is more of an ornament than of practical value to a smith. Still, you can’t convince a smith who is fascinated with the round pene hammer until you put him alongside of another smith where different kinds of repair work is done, and he finds that he is not “in it” to turn the work out fast. The round pene is of very little value anyway. It is supposed to be for riveting purposes, but even for that the face end of a hammer is better; for if the rivet is of common iron, the round pene will split the rivet, and it will crumble, while the face of the hammer will keep it together. The flat pene hammer is the hammer for the smith. 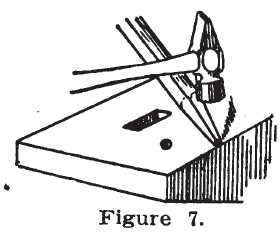 The trouble with the hammers used by most smiths is that they are made too short, and with a too wide face, which takes too much friction going through the air; and where the face is wide and level, the corners only will hit, and mar the work with dents. The hammer should be high, the face not too large and a little rolling-convex. Place the link or ring on the anvil and scarf as shown in Fig. 8. When one end has been scarfed, turn the link over, and scarf the other end, and the scarfs will then be on opposite sides, which makes a snug fit when lapped over each other. Now turn the link over the horn, and weld. In making chains, two links are welded separately and the third will be welded in between, and link them together. Links, rings, and washers are made on the same principle.